Sherry talks with Drs. Gloria and Heidi Horsley about Signs and Synchronicities on the Grief Journey. 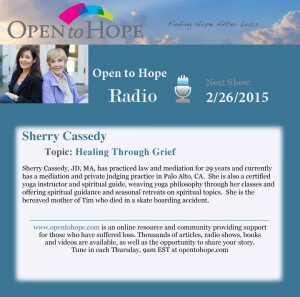 The program aired February 26, 2015, and can be listened to here. Following the loss of a loved one, many of us have experiences that are difficult to explain. Perhaps dreams of our loved one that feel incredibly real and linger with tastes or smells. Perhaps an encounter with nature that seems extraordinary, an amazing rainbow out of the blue, a multitude of butterflies or dragonflies. Perhaps an ordinary token — a coin, a heart, a hand — that appears frequently at potent times. Perhaps a confluence of events that connect us deeply to our loved one. We may tend to dismiss these signs and synchronicities because we don’t understand them and don’t want to appear foolish. But I believe they appear to comfort us. I am reminded of James Taylor’s lyric: “Tell me how do you stand there with your broken heart, afraid of playing the fool.” Our heart has already been torn open and in our vulnerability, we are reluctant to trust in even heartening signs and events.